Details the historic 1860 expansion of Pars from 12 to 20 Arrondissements. Plan Itineraire de Paris Publie. Nouvelle Division de Paris en 20 Arrondissements et 80 Quartiers au 1er. Janvier 1860. This is an extremely attractive 1860 pocket plan or case map of Paris, France by the French map publisher Andriveau-Goujon. 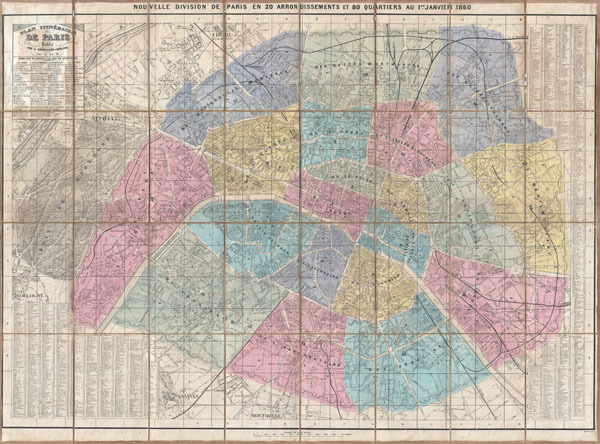 Covers central Paris as it appeared following the city's historic 1860 expansion from 12 to 20 Arrondissements. Detailed to the level of individual buildings with fortifications, palaces, churches, roads, railroads, rivers, forests and gardens noted. Shows the elaborate forest gardens surrounding Paris, in particular the Bois de Boulogne. A table in the upper left quadrant details the city's 80 Quartiers - which correspond to number sections on the map. The lower left and right hand portions of the map are dominated by a detailed street index. Dissected and mounted on linen. Comes with original linen binder. One of the largest and most impressive pocket maps of Paris we have come across. Very good. Original linen backing worn at some fold lines.